Most of my work today is focused on developing a quantum social science, in general but especially in my home field of IR. The result of this new science I believe will be a fundamental rethinking of our relationship with our fellow human beings, and with nature as a whole. 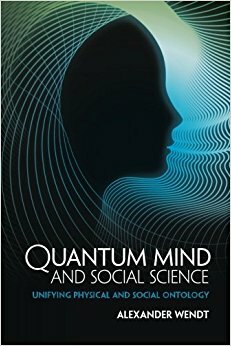 The argument of my 2015 book, Quantum Mind and Social Science (link) is essentially that social science – all of it, my earlier work too – is based on a mistake. Since the birth of the social sciences 150+ years ago, we’ve taken for granted that the mind and society obey the familiar laws of classical physics. On the surface that seems reasonable, since we know that other macroscopic objects like tables and chairs obey those laws, so why wouldn’t people, who are macroscopic too? Of course, that doesn’t necessarily make the standard approach to social science wrong, since it’s still possible that someone will solve the mind-body problem in classical terms. But one gets little sense from Fodor that’s going to happen anytime soon, and in the meantime social scientists are stuck with a worldview that has given us poor theories and deep philosophical controversies. So until the classical orthodoxy gets its act together, let’s keep an open mind for alternatives. Quantum theory provides one such alternative. Since the early 20th century we have known that classical physics breaks down at the sub-atomic level, where it must be replaced with the bizarre, counter-intuitive findings of quantum theory. Philosophers have been debating for decades what quantum “weirdness” tells us about the nature of reality. But most agree that “non-trivial” quantum phenomena – meaning stuff that is noticeably different from the predictions of classical physics and thus would justify a different framework for study – are mostly confined to sub-atomic particles. Above that level, interesting quantum effects are thought to “wash out” statistically (a process known as “decoherence”), and the classical physics of tables and chairs takes over. If so, then that would justify a classical social science even if elementary physics is quantum. But then we come back to consciousness, a macroscopic phenomenon which appears to have no classical explanation…. Enter quantum consciousness theory (here is a link to Stuart Hameroff's website), which hypothesizes that the deep structure of the brain enables sub-atomic quantum processes to percolate upward and manifest themselves at the macroscopic level in and/or as consciousness. According to the orthodoxy that’s impossible because of decoherence, so the theory is highly controversial – and as such, in making it the foundation of my social ontology, I am stepping not just straight but way “out of line.” But the hypothesis that the mind is quantum solves a number of long-standing philosophical problems in one stroke, which I argue makes it “too elegant not to be true.” And in the past decade there has been growing empirical evidence for the idea as well, from two areas of science. Let me give two examples of how what might seem like mere philosophical differences between the two perspectives can generate very different pictures on the ground, first of the individual and then of society. From a quantum perspective there is no need to give up the “illusions” of free will and consciousness. Rather than deterministic machines, human beings are “walking wave functions” with the freedom to choose who we will be at any given moment. As for feeling like a subject, in the collapse of the wave function, quantum physics provides an opening for projecting consciousness all the way down to the quantum scale (an ontology known as panpsychism), which quantum brains then amplify to the human level. These are controversial ideas, but controversial compared to what – that consciousness is an illusion? When the orthodoxy has run itself into the ditch, as even some mainstream philosophers are concluding, then it is time to consider the heterodox or even radical. Turning to our picture of society, the foundational assumption of the classical approach is that individuals, like any other macroscopic object, are 100% separable, physically distinct things – and on the surface that makes sense. Each of us seems completely encased in our own skin, such that nothing about our bodies, including our minds (which in the classical view are just brains), depends inherently or intrinsically on anyone else. We’re of course connected to each other in lots of causal ways, but (on this view) not intrinsically or logically. Ultimately, we are all alone. The upshot of the classical separability assumption I argue is an individualistic and competitive view of the human condition, in which conflict is the default setting (most famously as in Hobbes’ state of nature), and the challenge is therefore to cooperate in the face of powerful forces to the contrary. However, even when people do cooperate, the classical picture of society remains reductionist, since it is still made up of separate individuals. This individualistic view of society is so ingrained that you might wonder, what’s the problem? Well, first there is an intuition on the other side, which is that despite supposedly being completely separable, there seem to be lots of ways in which who we are cannot be separated from others: teacher/student, husband/wife, citizen/foreigner, master/slave, and so on. And if consciousness is quantum, then there is a physical basis for that apparent non-separability, which is that like all other organisms, our senses are entangled quantum mechanically with our environment, including each other's minds through language. In short, the quantum mind is not encased completely within its skull, but connected non-locally to the world around it. That doesn’t guarantee that people will always cooperate; it all depends on how much entanglement there is in a given case. (War can still happen in a quantum world). But it does frame our thinking about society much more holistically, such that it makes sense to think of people as pixels in a hologram, rather than as just seperable parts in a machine. To my mind, such a social holism is attractive not only philosophically, because it’s true, but politically, because it is more likely than individualism to bring people together in the increasingly urgent task of saving the planet, and with it our descendants. That’s the argument of Quantum Mind and Social Science in a nutshell, which I’m defending in a couple of articles responding to the book’s critics that are in the publication pipeline. However, while I hope you will read (and like!) the book, the real task going forward is to start “quantizing” social science. By that I mean taking existing social scientific theories, data, or methods and a) identifying classical assumptions in them, and then b) seeing if making them quantum changes our conclusions. Remember that quantum theory was not just a revolution in our understanding of the physical world; it was also a revolution in thought. There is a quantum logic, quantum probability theory, quantum decision theory, and quantum game theory, all of which can be applied anywhere that quantum assumptions are met. So quantizing social science means bringing to bear on social life a completely different conceptual apparatus than the one we have been teaching our students. That raises a final point about pedagogy and institutions. To quantize social science we need students who can think explicitly in quantum terms – ideally with the math, but if not, at least qualitatively as in my book. But since it has long been assumed that quantum theory was only relevant to physicists, they are almost the only people who ever learn it; certainly not social scientists, who in my experience have almost never even seen quantum math, and so do not know how to use it. So there is a need, in all of the social sciences, to find ways to train students in quantum thinking, both technically and philosophically. But that’s just the tip of the iceberg, since the point here ultimately is not just to create a more accurate social science, but to change society. That’s because for over three centuries we have in effect been teaching our children that the physical principles that govern the behavior of our fellow human beings are the same as those that govern the motions of the planets. If consciousness is quantum mechanical, then that is fundamentally wrong, and raises huge questions about the damage done, to individuals and to society, of training our naturally quantum brains to think within the narrow confines of the classical worldview (mass neurosis anyone?). If consciousness is quantum, in other words, then we are on the edge not just of scientific but cultural political paradigm shift just as profound as that which occurred after the previous, Newtonian revolution in physics over 350 years ago. My generation will not live long enough to learn whether consciousness and society really are quantum mechanical. But taking the idea seriously and exploring its potentially revolutionary implications has not only been the hardest work I’ve ever done as a scholar (took 10 years to write that book…), but also the most fun. And I think it’s the first time in my career that I’ve said anything as a social scientist that’s either true or false (think about that – I bet I’m not alone in that respect!). It’s what stepping straight out of line is all about. For a clear and pointed perspective on why, in light of quantum mechanics and the problem of consciousness, materialism should no longer be given a free pass to orthodoxy see this wonderful blog post by Adam Frank, the link to which is posted above. Professor Alexander Wendt (Ohio State University) presents the argument behind his latest book 'Quantum Mind and Social Sciences' and discusses the idea of humans as walking quantum wave functions. More information: http://www.projectqsydney.com Alexander Wendt, Mershon Professor of International Security and Professor of Political Science at Ohio State University and the author of 'Quantum Mind and Social Science', sits down for an interview with James Der Derian, Director of the Centre of International Security Studies and Project Q at the University of Sydney, to talk about quantum consciousness, walking wave-functions, non-locality in world politics and the need for the social sciences to get up to speed in a quantum age. For those interested in social theory in general and critical realism in particular this webinar will address the possible implications of quantum mechanics in helping to resolve some of the classic dualisms which inform sociology and its practice, namely those of structure/agency and mind/body.